Four years ago, a 10-year programme to connect and support inspiring young leaders was launched in Salzburg. Iggy Fenech chats to Shelagh Wright and Peter Jenkinson Obe about Malta’s first participation last year. Imagine a world in which young bright minds were given the opportunity to change their communities and their countries; a world in which cultural diversity could help strengthen ties across nations, and lead to cross-idea generation to solve problems and help inspire innovation. The possibilities would be endless, and the first step towards making that a reality was taken in 2014 in Salzburg, Austria with the set-up of The Young Cultural Innovators Forum (YCIF). The 10-year project, which is now approaching its fifth installment, was founded to help those making a difference in their community across the continents to develop their practical skills, reflect on their leadership potential, build their networks on a global scale, and deepen strategies for innovation and social development. “We believe the quote ‘the future is what old people talk about and young people do’ explains it perfectly,” say Shelagh Wright and Peter Jenkinson OBE, the lead facilitators of the YCIF’s programme at the Salzburg Global Seminar, and collaborators on many cultural and creative innovation development activities across the world. Over the years, Young Cultural Innovators from over 50 countries have attended the yearly seminars but it was last year that, through a partnership between Arts Council Malta and the US Embassy in Malta, two Maltese creatives got the chance to join the rest of the world in developing their skills. Chosen from a long list of participants that had answered the local call, visual artist and project coordinator, Kristina Borg, and design architect and board member of the Malta Society of Arts, Elyse Tonna, headed to Salzburg for the fourth edition of the Forum. During their week there, they were immersed in intensive dialogue, skill build-ing, peer mentoring, exchange, inspiration and creativity. The importance of a programme like this, of course, cannot be overestimated, particularly in a world which seems more fragile than it has in this past generation. Working together doesn’t just help us find solution to mutual problems, but creates connections and partnerships between people, communities and nations. Meanwhile, the young leaders are given a chance to change the future they will live in themselves, and contribute more directly and effectively towards building the world they envisage. This, however, is not the beginning of Shelagh and Peter’s relationship with Malta, as both have worked very closely with us in the spheres of arts and culture... they worked together on the strategy for Arts Council Malta with Toni Attard. Moreover, they supported middle leadership development and worked on a ‘Pop-up Creative Hub’ with Maltese and global artists during the World Summit on Arts and Culture in Valletta in 2016 with Caldon Mercieca. The next YCIF will take place in October, and Malta is once again looking to take part. 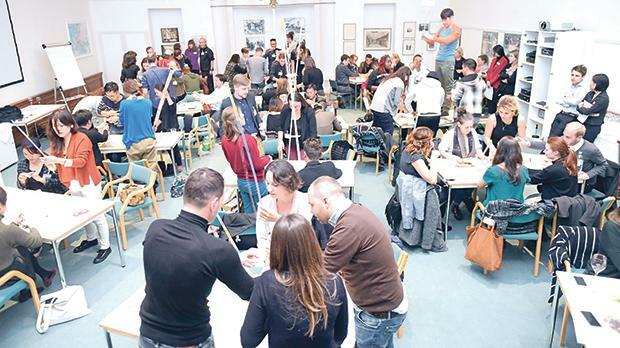 While the call has not been issued yet, it is definitely something Malta’s young and aspiring leaders should look out for, because on top of being a life-changing experience, this could also help Malta develop in the way the younger generation would like it to.